It is get easy to get outraged by events around you, but I have learned, through hard experience, that writing when outraged is dangerous. After all, once you have climbed onto your high horse, it is easy to find fault with others and wallow in self-righteousness. It is for that reason that I have deliberately avoided taking issue with investment banking valuations of specific companies, much as I may disagree with the practices used in many of them. I understand that bankers make money on transactions and that their valuations are more sales tools than assessments of fair value and that asking them to pay attention to valuation first principles may be asking too much. Once in a while, though, I do come across a valuation so egregiously bad that I cannot restrain myself and reading through the prospectus filed by Tesla for their Solar City acquisition/merger was such an occasion. My first reaction as I read through the descriptions of how the bankers in this deal (Evercore for Tesla and Lazard for Solar City) valued the two companies was "You must be kidding me!". At the time of the deal, Mr. Musk contended that the deal made sense for stockholders in both companies, arguing that it was a "no-brainer" that would allow Tesla to expand its reach and become a clean energy company. While Mr. Musk has a history of big claims and perhaps the smarts and charisma to deliver on them, this deal attracted attention because of its optics. Mr. Musk was the lead stockholder in both companies and CEO of Tesla and his cousin, Lyndon Rive, was the CEO of Solar City. Even Mr. Musk's strongest supporters could not contest the notion that he was in effective control at both companies, creating, at the very least. the potential for conflicts of interests. Those questions have not gone away in the months since and the market concerns have been reflected in the trend lines in the stock prices of the two companies, with Solar City down about 24% and Tesla's stock price dropping about 8%. The board of directors at Tesla has recognized the potential for a legal backlash and as this New York Times article suggests, they have been careful to create at least the appearance of an open process, with Tesla's board hiring Evercore Partners, an investment bank, to review the deal and Solar City's board calling in Lazard as their deal assessor. Conspicuously missing is Goldman Sachs, the investment banker on Tesla's recent stock offering, but more about that later. In the Tesla/Solar City deal, the bankers faced a particularly difficult challenge. Finding synergy in this merger of an electric car company and a solar cell company, one of which (Tesla) has brand name draw and potentially high margins and the other of which is a commodity business (Solar City) with pencil thin margins) is tough to do. Arguing that the companies will be better managed as one company is tricky when both companies have effectively been controlled by the same person(Musk) before the merger. In fact, it is far easier to make the case for reverse synergy here, since adding a debt-laden company with a questionable operating business (Solar City) to one that has promise but will need cash to deliver seems to be asking for trouble. The bankers could of course have come back and told the management of both companies (or just Elon Musk) that the deal does not make sense and especially so for the stockholders of Tesla but who can blame them for not doing so? After all, they are paid based upon whether the deal gets done and if asked to justify themselves, they would argue that Musk would have found other bankers who would have gone along. Consequently, I am not surprised that both banks found value in the deal and managed to justify it. Conveniently, these number provide backing for the Musk acquisition story, with Evercore reassuring Tesla stockholders that they are getting a good deal and Lazard doing the same with Solar City stockholders, while shamelessly setting value ranges so wide that they get legal cover, in case they get sued. Note also not only how much money paid to these bankers for their skills at plugging in discount rates into spreadsheets but that both bankers get an additional payoff, if the merger goes through, with Evercore pocketing an extra $5.25 million and Lazard getting 0.4% of the equity value of Solar City. There are many parts of these valuations that I can take issue with, but in the interests of fairness, I will start with what I term run-of-the-mill banking malpractice, i.e., bad practices that many bankers are guilty of. No internal checks for consistency: There is almost a cavalier disregard for the connection between growth, risk and reinvestment. Thus, when both banks use ranges of growth for their perpetual value estimates, it looks like neither adjusts the cash flows as growth rates change. (Thus, when Lazard moves its perpetual growth rate for Solar City from 1.5% to 3%, it looks like the cash flow stays unchanged, a version of magical growth that can happen only on a spreadsheet). Discount Rates: Both companies pay lip service to standard estimation technology (with talk of the CAPM and cost of capital), and I will give both bankers the benefit of the doubt and attribute the differences in their costs of capital to estimation differences, rather than to bias. The bigger question, though, is why the discount rates don't change as you move through time to 2021, where both Tesla and Solar City are described as slower growth, money making companies. Pricing and Valuation: I have posted extensively on the difference between pricing an asset/business and valuing it and how mixing the two can yield a incoherent mishmash. Both investment banks move back and forth between intrinsic valuation (in their use of cash flows from 2016-2020) and pricing, with Lazard estimating the terminal value of Tesla using a multiple of EBITDA. (See my post on dysfunctional DCFS, in general, and Trojan Horse DCFs, in particular). Outsourcing of cash flows: It looks like both bankers used cash flow forecasts provided to them by the management. In the case of Tesla, the expected cash flows for 2016-2020 were generated by Goldman Sachs Equity Research (GSER, See Page 99 of prospectus) and for Solar City, the cash flows for that same period were provided by Solar City, conveniently under two scenarios, one with a liquidity crunch and one without. Perhaps, Lazard and Evercore need reminders that if the CF in a DCF is supplied to you by someone else, you are not valuing the company, and charging millions for plugging in discount rates into preset spreadsheets is outlandish. I follow a rule of keeping the growth rate at or below the risk free rate but I am willing to accept the Lazard growth range of 1.5-3% as within the realm of possibility, but my reaction to the Evercore assumption of 6-8% growth forever in the Tesla valuation or even the 3-5% growth forever with the Solar City valuation cannot be repeated in polite company. 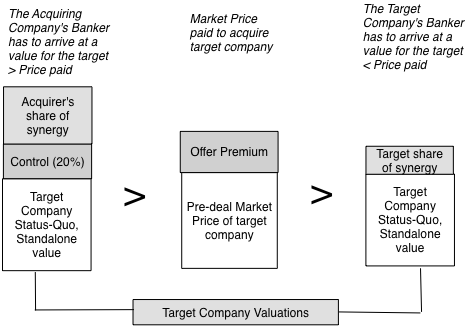 Not content with creating one set of questionable valuations, both banks doubled down with a number of of other pricing/valuations, including sum-of-the-parts valuations, pricing and transaction premiums, using a "throw everything at the fan and hope something sticks" strategy. I don't think that Tesla's Solar City acquisition passes neither the smell test (for conflict of interest) nor the common sense test (of creating value), but I am not a shareholder in either Tesla or Solar City and I don't get a vote. When Tesla shareholders vote, given that owning the stock is by itself an admission that they buy into the Musk vision, I would not be surprised if they go along with his recommendations. Tesla shareholders and Elon Musk are a match made in market heaven and I wish them the best of luck in their life together. As for the bankers involved in this deal, Lazard's primary sin is laziness, accepting an assignment where they are reduced to plugging in discount rates into someone else's cash flow forecasts and getting paid $2 million plus for that service. In fact, that laziness may also explain the $400 million debt double counting error made by Lazard on this valuation,. Evercore's problems go deeper. The Evercore valuation section of the prospectus is a horror story of bad assumptions piled on impossible ones, painting a picture of ignorance and incompetence. Finally, there is a third investment bank (Goldman Sachs), mentioned only in passing (in the cash flow forecasts provided by their equity research team), whose absence on this deal is a story by itself. Goldman's behavior all through this year, relating to Tesla, has been rife with conflicts of interest, highlighted perhaps by the Goldman equity research report touting Tesla as a buy, just before the Tesla stock offering. It is possible that they decided that their involvement on this deal would be the kiss of death for it, but I am curious about (a) whether Goldman had any input into the choice of Evercore and Lazard as deal bankers, (b) whether Goldman had any role in the estimation of Solar City cash flows, with and without liquidity constraints, and (c) how the Goldman Sachs Equity Research forecast became the basis for the Tesla valuations. Suspicious minds want to know! As investors, the good news is that you have a choice of investment bankers but the bad news is that you are choosing between the lazy, the incompetent and the ethically challenged. If there were any justice in the world, you would like to see retribution against these banks in the form of legal sanctions and loss of business, but I will not hold my breath waiting for that to happen. The courts have tended to give too much respect for precedence and expert witnesses, even when the precedent or expert testimony fails common sense tests and it is possible that these valuations, while abysmal, will pass the legally defensible test. As for loss of business, my experience in valuation is that rather than being punished for doing bad valuations, bankers are rewarded for their deal-making prowess. So, for the many companies that do bad deals and need an investment banking sign-off on that deal (in the form of a fairness opinion), you will have no trouble finding a banker who will accommodate you. If this post comes across as a diatribe against investment banking, I am sorry and I am not part of the "Blame the Banks for all our problems" school. In fact, I have long argued that bankers are the lubricants of a market economy, working through kinks in the system and filling in capital market needs and defended banking against its most virulent critics. That said, the banking work done on deals like the this one vindicate everyone's worst perceptions of bankers as a hired guns who cannot shoot straight, more Keystone Kops than Wyatt Earps! The post unexpectedly cuts off at "First, ...and it i". Is this complete or some parts are missing? You refer to Lazard at "Lehman" at one point in your post. Thank you for your teachings! You fail to mention that the majority shareholder for Tesla has recused himself from voting, as has his cousin. Odd omission, unless knowing that would deflate ones opinion. Aswath, no worries. Glad to see others got it also.....I kept reading Lehman and was like are these guys still around...you could probably just use variables L and E and over the course of time the reader could just insert his own I-bank. Do you have any guidelines/lessons/papers on adjusting WACC over time/in the terminal year. I imagine in this case some of the things that would change: D/E ratio (move towards indudstry average), tax rate (move to/closer to a marginal tax rate in the terminal year), cost of debt (lower - not sure how to estimate in terminal year), beta (unsure here - no change because we generally take an industry average regardless? ), etc. Maybe I'm missing a few...or a lot? Maybe the use of the functional valuation theory helps to bring some light into the tunnel here. 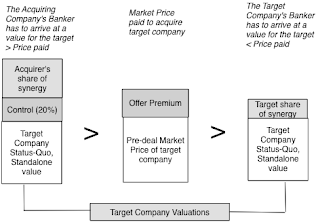 According to the functional valuation theory, the value of a company depends on the purpose of the valuation. One purpose can be to estimate the maximum price that Tesla could pay for Solar City in order not to be worse off than without the transaction. Any price paid below this decision value should create shareholder value, any price paid above it will destroy shareholder value. If you as a minority shareholder of Tesla think the assumption made in the valuation are too bullish - sell the shares (that is what obviously some shareholders did). You could also determine a decision value for the minority shareholders of Solar City. This would be the minimum price they would have to receive in order not to be worse off compared to when they keep their shares in the company. If the decision value of Tesla is above the decision value of Solar City's shareholders, a deal would make sense to both parties at a price between the two decision values. The issue here is that at the end of the day the shareholders of Solar City can be forced to sell. So another purpose of the valuation could be to come up with an arbitration value that protects the interests of all parties involved. Such an arbitration value should not be below the decision value of those shareholders that can be forced to sell, i.e. here the Solar City shareholders. This is what a "fairness opinion" in my opinion should take into consideration. In reality, most fairness opinions at best pretend that they consider this. Taking into consideration who hires the investment bankers, it should come as no surprise that these valuations serve a different purpose: to influence the shareholders to get a favorable deal. In the terminology of the functional valuation theory, this is called an "argumentation value". Most valuations in business practice are argumentation valuations (in a sense that they are prepared with the purpose to influence the counter-party to agree to a transaction that is favorable to the own party). And there is in principle nothing wrong with that (as long as this purpose is clear to all involved). If you intend to buy or sell a company, you have to find a way to get the negotiations started. Valuations serve as an instrument of communication between the parties. However, in the case here what we have is a argumentation value which comes "dressed" as an "arbitration value" (or fair value) - and this is an issue as the shareholders of Solar City don't really have any power regarding the change of ownership. Bottom line, I don't believe it helps here to criticize the valuations (they serve their purpose, in my opinion). The real issue here is corporate governance. Maybe one way-out could be not to let the management, but someone else (SEC?) pick the institution that performs the valuation in such situations. A long shot. When Buffett buys a company outright. Eg. BRK buying PCP or BNSF, do investment banks have to put together the same merger documents you are commenting on? It would be interesting to see what analysis Buffett allows them to come up with...I'm sure he wouldn't let the B.S and laziness you found slip through. I am sure Elon wanted the transaction in order to keep Solar City afloat. The two investment banks were merely respecting the wishes of its customer and rubber stamping the deal. That was a great read professor! Thanks for bringing to light such holes that even the supposed bulge brackets can't escape. The analysts probably work their backsides off with 16 hour days and then the final output is this. Wonder if anyone at all reads the 100+ slide decks anymore. It's all a sham! I am sure Elon wants the transaction and that the bankers were just doing what they needed to get the deal done. If you are going to do this, have the minimal courtesy of at least trying to go through the motions and covering up your bias. These banking valuations were inept insofar as the bias was obvious and easily spotted. Either they did not care about valuation basics or they did not know valuation basics or both.. The answer is no. Buffet's axioms are like Confucian sayings. They sound profound, especially when he says them, but stripped down to basics, there is less there than meets the eye. I liken them to what the stuff you get out of Fortune cookies. Read them, laugh if they are funny, and then move on. If you're shocked by this incident more than any other valuation issued by so called advisors you simply haven't read enough valuations. The reality is that a business is only worth what someone else is willing to pay for it. In failing to explore this avenue the board makes itself complicit in the failure to determine the true value. These valuations are nothing but legal contingency planning. A friend who is an investment banker, is using this post as a case study to help teach younger colleagues. Fairness Opinions: Fix them or Flush them! The School Bell Rings! It's Time for Class!